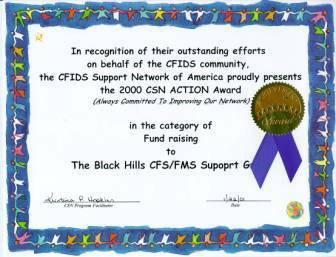 The CFIDS Association of America and the CFIDS Support Network (CSN) presented Black Hills CFS/FMS Support Group the 2000 CSN ACTION (Always Committed to Improving Our Network) Award in the category of Fund Raising. CSN ACTION Awards are presented each year to CSN groups who have shown excellence in service to the CFIDS community. This award is shared by the group and recognizes it cumulative efforts from September 1, 1999 through August 31, 2000 in nine categories: Advocacy, All Around, Awareness Day, Education, Fund Raising, General Support, Media, Pediatric CFIDS and Publications. A gift certificate, which is redeemable for $150 worth of educational materials available from the Association, accompanied the award. CSN Champion Awards are also presented to individuals who have offered outstanding support on behalf of persons with CFIDS. Elaine Dodson of our support group received honorable mention in the category of Local Group Volunteer, Person With CFIDS (PWC).